I produce some music tunebooks, which as well as a printed or printable score, are available in 'ABC' digital music format. This page contains suggestions as to how to listen to the tunes using the ABC files. The abc files for the tunebooks contain digital definitions of the tunes. An example is the ABC file of Paul Hardy's Session Tunebook. ABC is a simple format which has become a standard for exchange of music notation by electronic media such as email. See the ABC notation page for a description of ABC. See my Tunebook Process page for more information on how I produce the tunebooks. These are several programs (free and commercial) that will read ABC files, and both display and play the tunes. I suggest two free programs that do this simply, and let you vary the speed of playback, so that you can play along. They also let you edit the source of the ABC to change the tune. On Windows, ABCExplorer is my current favourite. 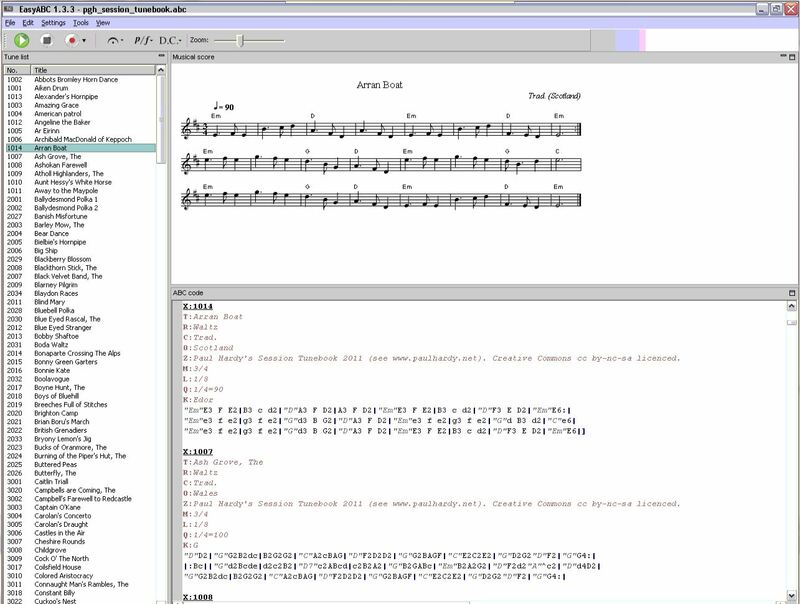 This has a text editor which colour codes the different elements of an abc tune, gives a preview of the score as you edit, and can play a tune as midi through the computer speakers. The author is known as 'Billig'. EasyABC is a recent alternative by Nils Liberg with similar display, playing, and edit with preview functionality. It works on Linux as well as Windows. 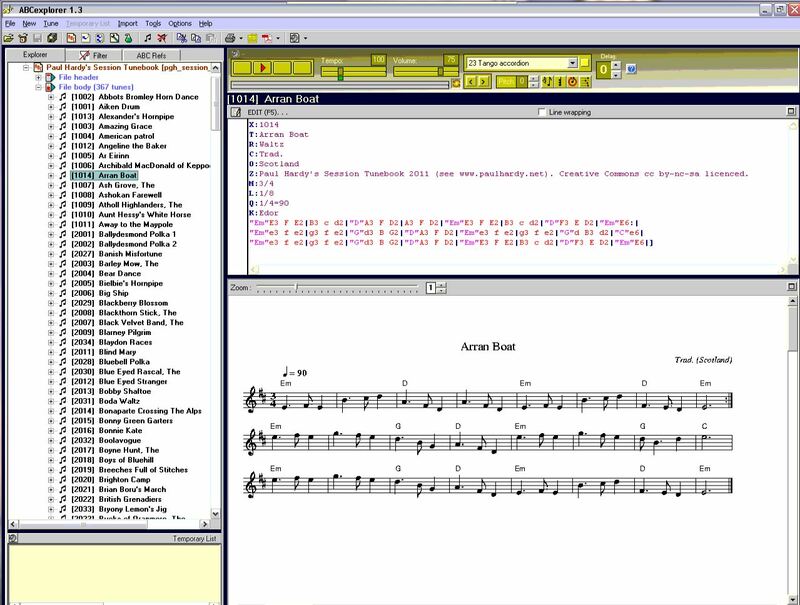 Both these programs are in fact graphical front-ends, and rely on two other programs behind the scenes - abc2midi to play the music, and abcm2ps to display the score. Download and install the ABCExplorer software from the ABCExplorer site. Download the abc file of my Session Tunebook from my tunebooks page. Start ABCExplorer, and use the 'File' menu to navigate to and open pgh_session_tunebook.abc. The file name should appear in the left side of the screen. Click on the + sign next to it to get a list of tunes. Click on a tune in the list, and it should be shown on the right hand side, with the abc source in the top pane, and the music score in the bottom. Click on the red arrow button at top middle to play the tune. You can vary the speed using the tempo slider bar. If you just see introductory text in the panel where the musical notation should be, then click on Options menu, choose the Editor tab, and untick the option for “Use data of the file header to display the score”. Download and install the EasyABC software from the EasyABC site. Download the abc file of my Session Tunebook from my tunebooks page. Start EasyABC, and use the 'File' menu to navigate to and open the abc file. A list of tunes should appear in the left side of the screen. Click on a tune in the list, and it should be shown on the right hand side, with the music score in the top pane, and the abc source in the bottom. If you get the tunebook intro page rather than the score, then there is a toggle in the Settings to ignore the file header. Click on the green arrow at top left to play the tune. The ABC content for the Session tunebook is also available in a versatile App called "Abc Session Viewer" (not written by me) to run on Android tablets or on iPads - see the Android version or iPad version. This does one-click transposition, guitar and mandolin tabs, etc. As of January 2017, there is a later version just for iPhone and iPad called ABC Viewer II. I also use an app on my iPhone called Tunebook SD, which can play and display from ABC files including my ones. Enjoy the music, and play along with it!